The planet Mercury is very difficult to study from the Earth because it is always so close to the Sun. Even at elongation, it is never more than 28 degrees from the Sun in our sky. It is the second smallest planet (it was believed to be the smallest until the discovery that Pluto is actually much smaller than originally thought), and also the fastest in its orbit since it is the innermost planet. In fact, the name Mercury derives from its speed in moving around its orbit. We began to learn more about Mercury with radar imaging from the Earth in the 1960s, and obtained most of what we know about the planet from the Mariner 10 space probe was placed into a complicated orbit involving Venus and Mercury and which passed close to Mercury and sent back information three times in the period 1974-1976. The orbits of Venus and Earth appear to be circles on this scale, but the orbit of Mercury is clearly not circular. As a result of its highly elliptical path the distance between Mercury and the Sun varies a large amount, from 46 million kilometers at perihelion to 70 million kilometers at aphelion. Its mass is 5.5% of the Earth's mass, which is 5 times the mass of the Moon (the best determination of the mass came from detailed tracking of the spacecraft Mariner 10). The density is 5.5 g/cc, the same as Earth, and it has a magnetic field that is about 1% of the strength of Earth's field. These facts suggest a differentiated interior with a large iron core, with the weakness of the magnetic field related in some way to the slow rotational period relative to the Earth. Its rotational period is 59 days, as determined by radar measurements from the Earth using the Doppler effect. The ratio of the rotational period to the orbital period is 2/3, and is an example of more complicated tidal locking than for the Earth-Moon system. The tidal interaction between the Sun and Mercury leads to a 2/3 ratio (instead of 1/1 as for our Moon) because the orbit of the Moon about the Earth is almost a circle, but the orbit of Mercury around the Sun is rather elliptical. The surface conditions are among the harshest in the Solar System. During the long Mercurian day the temperature rises to about 425 degrees Celsius, hot enough to melt lead and hotter than any planet except Venus. Because there is no substantial atmosphere to retain heat, during the equally long nights, the temperature drops quickly to around -180 degrees Celsius, which is among the coldest found in the Solar System. This range of -180 Celsius at night to 425 Celsius in the day is the largest surface temperature variation in the Solar System. Speaking loosely, we may characterize Mercury as being much like the Earth on the inside and much like the Moon on the outside. However, the analogies cannot be pushed too far. 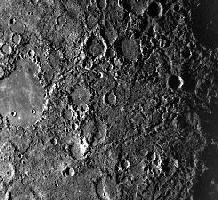 For example, the detailed early history of the surface was probably different for Mercury than for the Moon. As noted previously, the density of Mercury and the magnetic field suggest geological differentiation and a large iron core. In the case of the Earth the metallic core occupies about 16% of the interior by volume and in the case of the Moon the core occupies about 4% by volume. In the case of Mercury the core is thought to occupy about 50% of the interior by volume (and a whopping 70% by mass). Thus, Mercury is a planet with a very large iron core and a comparatively thin mantle compared with the Earth. Smooth plains that resemble Lunar maria. Intercrater plains, which are pocked with small craters and occupy about 70% of the surface that we have examined. Rugged highlands that bear some resemblance to the corresponding regions on the Moon. The adjacent image shows a mosaic of photgraphs taken from Mariner 10 in 1974 that summarizes the character of the surface. The following images illustrate three features from the surface of Mercury: (1) a large impact basin that is similar to Mare Imbrium on the Moon, (2) the highlands of Mercury, (3) and an example of a large geological fault. There is no evidence for large-scale tectonic motion. It is believed that plate tectonics requires differentiation of the interior, and a large enough volume to trap sufficient radioactive material to heat subsurface layers and produce a plastic consistency below the crustal plates. Mercury is thought to be too small for this to take place, thus explaining the lack of large-scale tectonics. After formation the mass of the planet was differentiated into a large iron core and thin mantle. Lava flowed outward through cracks in the mantle and formed the intercrater plains. The oldest surfaces are about 4.2 billion years old. Solar tides slowed the rotation and formed large-scale linear features (scarps and lines of cliffs) that we see today. The intense meteor bombardment characteristic of the early Solar System caused cratering and produced large impact basins like the Caloris Basin. Starting about 3.8 billion years ago, the smooth plains were created, possibly from volcanic activity triggered by the earlier meteor impacts and erupting from the large impact basins. After the volcanic activity subsided, the planet has been very quiet geologically except for the occasional meteor (however, it is probably geologically more active than the Moon). We see that this scenario shares some features with the corresponding history of the Moon, but details, particularly early ones, are different. As a consequence, the surface of Mercury looks superficially like the Moon, but there are significant differences that appear upon closer inspection.